The US Open women's singles final has opened up a long-overdue debate on sexism and double standard in the sport, splitting the tennis world on whether male and female players are treated differently. Now, adding fuel to the fire, a cartoon featuring Serena Williams has come under severe criticism for portraying the tennis superstar with sexist and racist undertones. Australian cartoonist Mark Knight's cartoon was lambasted by several people on social media, including author J.K. Rowling who called out the cartoonist for using racist and sexist tropes. “Well done on reducing one of the greatest sportswomen alive to racist and sexist tropes and turning a second great sportswoman into a faceless prop.” J.K. Rowling tweeted. Following her loss to Japan's Naomi Osaka in the US Open final, Serena was handed three code violations, causing the American to call out the different treatment of male and female players. The 23-time champion had a heated exchange with chair umpire Carlos Ramos after she was penalised for “receiving coaching” during the match, for smashing her racquet and for calling the umpire a “liar” and a “thief”. She later went on to say that the docked point and game was a result of sexism as male players have gotten away with saying far worse things. Serena was fined USD 17,000 for the code violations. In defense of the cartoon, Knight replied to a user on Twitter that he had done a similar cartoon on Nick Kyrgios when umpire Mohamed Lahyani gave him an on-court pep talk as he was trailing by a set in his match against France's Pierre-Hugues Herbert. In this cartoon, two panels show 'what happened' with a sullen Kyrgios receiving the pep talk and 'what should have happened' showing a woman holding the Australian by his ear. However, it has been pointed out that Knight chose to depict an exaggerated and stereotypical version of Serena Williams' on-court behaviour as a baby throwing a tantrum on court, while a calm-looking Kyrgios is simply called “a tennis brat”. 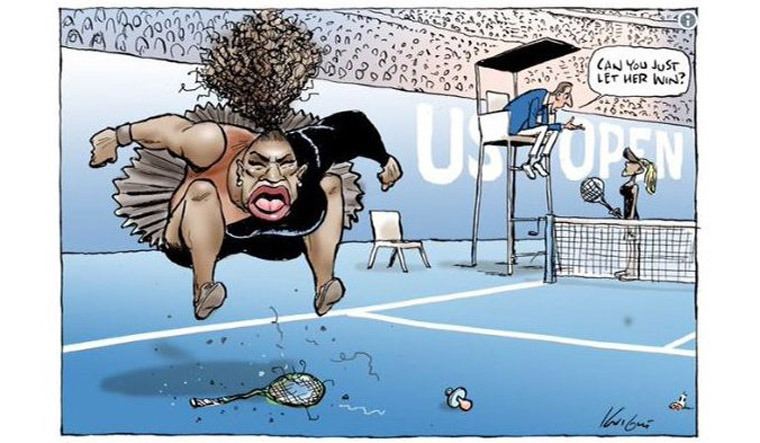 While the Herald Sun and Knight maintain that the cartoon was not racist or sexist, people were quick to point out that the cartoonist had also “whitewashed” Naomi Osaka. Osaka, who is of Haitian and Japanese descent, has been portrayed as a blonde, faceless white woman standing next to the chair umpire. Why has Naomi Osaka turned into a blonde white woman? There really aren't "two points of view" on this particular cartoon. Intention and impact were the same. He _intended_ to vilify Serena Williams, and did so using appallingly racist stereotypes at the same time as erasing the race of Naomi Osaka AND the umpire. it's grotesque. the oversized lips, her hair, her nose, her body. he's made her as hulking and ugly as he can and just to really highlight it, he's turned Naomi Osaka, who has dark skin, into a white girl with blonde hair. he seriously needs to think about why he did that. Okay @Knightcartoons, fair point that you couldn't draw Serena Williams looking like Taylor Swift, so why did you draw Naomi Osaka as a blonde? Honest question.